Posted by Administrator in Drama, Requiscat in Pacem. The English Canon has lost one of its true giants. Paul Scofield, one of the leading lights of the English stage, died Wednesday, March 19 at age 86 after a battle with leukemia. Hailed by numerous peers and critics as one of the greatest actors of our time, Scofield did not take the steps to transform the success he had on the stage for success on the silver screen. This “failure to go to the next level” has mystified some of Hollywood’s more materialistic observers. But it is very much in keeping -even logical- for a man who sought not for fame and adulation, but rather desired to show his greatness mostly to audiences and to devote himself to his family. Scofield was noted as early as the ’40s as an actor blessed with preternatural gifts; a gravelly yet adaptable voice (Fred Zinneman described it as “a Rolls-Royce starting up”) and a tall frame that he could fit into any role. His portrayal of King Lear of 1962 is hailed by many (including Corin Redgrave and Sir Ian McKellen) as the greatest Shakespearean performance in memory history. It was his performance of the merry yet morally upright Thomas More in Robert Bolt’s A Man for All Seasons that garnered the attention of Hollywood, as Fred Zinneman’s production of the play into a film garnered the film Best Picture, and Scofield himself Best Actor. Yet Scofield sent a clear message that fame was not his interest, as he skipped the Oscar ceremony and Dame Judith Hiller accepted Scofield’s award in his name. Scofield himself went back to the stage. He had stated clearly that fame was not an interest. Despite his international fame, when the curtain fell, Mr. Scofield hopped the commuter train back to his family. He did not often mix socially with theater people. At home, only 10 miles or so from his birthplace, was his wife, the former Joy Parker, an actress he married in 1943 and remained with for 65 years, until his death; a daughter, Sarah, and a son, Martin. They all survive him. From A Man For All Seasons, while being confronted by Cardinal Wolsey. As King Lear, quite possibly from his epic 1962 stage performance, directed by Peter Brook. If there was any doubt that Scofield had no interest in larger fame, his treatment of the role of Salieri in Peter Shaeffer’s Amadeus had to put it to rest. Scofield’s Salieri on stage was just as powerful as his Thomas More from 20 years previous. And like More, Hollywood wanted to transfer Salieri and Mozart from the stage to the screen. The role was offered, and Scofield absolutely balked. He said there was no way he was going to take months away from his family again. The role was given to F. Murray Abraham, who then won the Best Actor Oscar in 1985 by mimicking Scofield’s stage performance. He did sometimes come back to the screen, playing Judge Danforth in The Crucible, the troubled French king Charles VII in Henry V and Mark Van Doren in Quiz Show. (Robert Redford directed Quiz Show, and the story goes that he wanted only Scofield for the role of Charles Van Doren’s erudite and innocent father, and Scofield was extremely reluctant to take the role. Redford had to engage in more than a little beseeching to get Scofield to acquiesce.) Any screen performance you may see with Paul Scofield shows him an actor with marvelous range and an unavoidable tendency to steal whatever scene he might be in. I have damned few heroes in my life. James Garner -despite his politics- and Paul Scofield are just about it as far as contemporary public personae go. Those are -were- really the only two actors I would have been deeply honored to meet, and now one of them is gone. 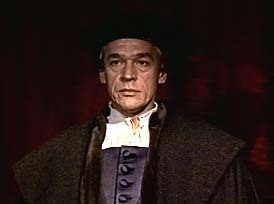 Paul Scofield, Requiscat in Pacem.